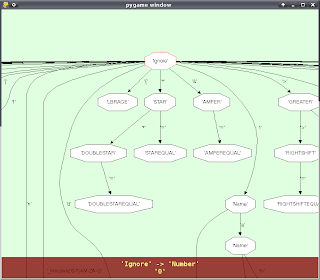 Have you seen this graph of the Python grammar? Yes, this is sort of cool already, but it doesn't really give you as much information as the grammar itself. It's more of an overview-like thing. Check out ANTLRWorks or ANTLRStudio for superb visualization of grammars. Yeah, ANTLRWorks seems pretty nice in that respect. Thanks for the hint. So, would you consider trying to port the current ANTLR's Python runtime to RPython a good way for me to start doing something with PyPy? I would post to the pypy-dev mailing list instead, it is better to discuss such longish things there. Thanks for you interest! Does it use Graphviz's dot utility for rendering? That's bad it cann't be used as a standalone product without the need to install Graphvis.